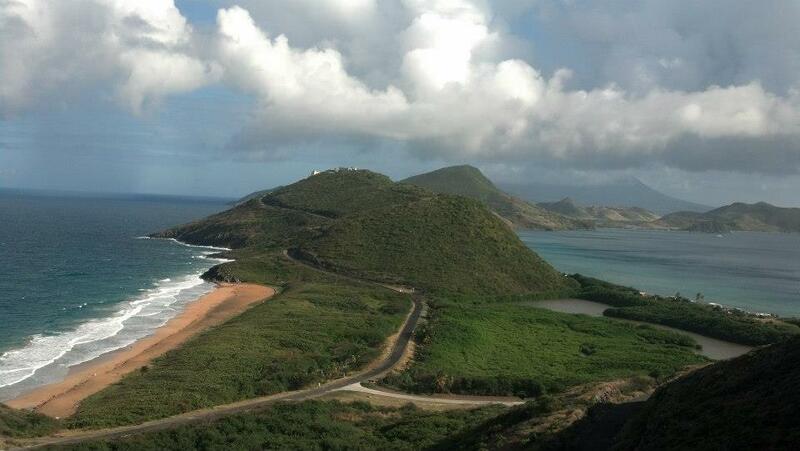 There is an overlook in St. Kitts and Nevis where you can see the small isthmus that connects these volcanic islands together. Standing on this overlook, you can see both the Atlantic and Caribbean Oceans. One is choppy and violently crashes its surf; the other is nearly still with a surface barely broken by gentle waves. I think I might be an isthmus between two islands. My existence feels a little chaotic. I am at times joyful and incredibly chill, other times angry, often impatient, still other times depressed, withdrawn and incredibly anxious, and most of the time exhausted. I am a bit of a mess. My emotions are all over the place. In the days since Match Day, I feel like I have had very little control. Hope will not come to live with me for several months yet, despite the fact that I’d like to board a plane to fetch her immediately. I mean stat! Accepting the reality that neither of us is ready for the big move is hard. Her room has been a guest room with extra storage for 12 years; I have a lot of sifting, sorting, packing and donating to do to be ready for her arrival. I also have a plan to be finished drafting my dissertation by December; the completion of that draft on time is essential for me to stay on schedule to graduate next spring. I’m anxious about possibly taking custody around the holidays because I am afraid Hope will be overwhelmed, resulting in my being overwhelmed. I am also still enduring well-intended, but frankly stupid commentary. “I can’t believe the agency is letting you adopt alone. You really need a husband.” “Why don’t you know things like X, Y and Z about your new daughter?” How is it that silly comments can already make me feel inadequate as a mom when my mommy-dom is so new and in some ways doesn’t feel official yet? It is more important than ever that I learn to guard myself against hurtful words and practice forgiveness and judgment-free living. Forgiveness has never been something I have withheld in great amount, but I am finding that the need to practice it (with a side of grace) at this point in my life is more intense than ever. I am also finding the old, more judgmental me is slipping away, which is a good thing. At least two people have shared adoption horror stories with me in the last few days, though I’m not sure what the purpose of the story was supposed to be other than to scare me. A year ago, I couldn’t believe that anyone’s adoption placement might fail, and I blamed those parents for not trying hard enough. I don’t blame them anymore; I know better. It happens, and it is devastating. I have discovered a pool of compassion I didn’t know I had for all parties involved in a failed placement. At this point, I find failed stories so painful, gossipy and non-supportive of adoptive families. When I recently said no to a child, I know it was the right decision. I knew such a placement looked good on paper, but would be ultimately be a disaster. This is not an easy path. I’m learning that forgiveness of all the people making comments that are not supportive of me or adoptive families in general is critical. It is really the only way I can reduce whatever pain hurtful words inflict. I have to let it go, not for them but for me and Hope. At the other end of the continuum, there is peacefulness about moving forward with my new daughter. It is odd that this calmness coexists with the madness swirling around me. I went into the room that will be Hope’s room today. I recently stripped the room of its old décor and had it painted white. There’s a lot of work that needs to be done in there to prepare for her arrival. I found the task of room prep (getting rid of things from Pre-Hope days) overwhelming until today when I went in and started pulling things down to send to the Goodwill tomorrow. I realized that I will relish in tossing some things out and repurposing other things. I am excited about creating some design concepts to send to Hope. This transition is a beautiful thing and in some ways I’m running towards it. Today the tasks brought me a sense of satisfaction; I’m preparing for this change and this young person in a very concrete way. It isn’t hypothetical and it isn’t conceptual anymore. I also realized that I need this time and that embracing this awkward period is a good thing. Although I am eager for Hope to come home to me, I realize that the few months of waiting will give us both some time to prepare ourselves. Again, this isn’t an easy path; preparation time is needed. By my own reckoning I need at least 6 more weeks to get ready. The reality is that this time will also allow me to get through the heavy lift of conducting my research and writing my dissertation this fall. Besides it will only be a few weeks until we are Skyping regularly. I’ll see her face, hear her voice, begin to learn how we will navigate this new path together. Something about embracing this transition period brings me comfort. I can take a deep breath, pick out paint, write and dream about our tomorrows. And yet, both of these emotional states, anxiety and calm, wax and wane. I can float from one side of narrow isthmus to the other in a matter of moments. The triggers are difficult to manage and exhausting, but I figure I will get better at it during the next few weeks and months. I will continue to learn to not take things personally and to forgive, forgive and forgive again. I hope that my family and friends will be patient with me. I’m a bit of a handful these days. This entry was posted on Tuesday, September 3rd, 2013 at 2:02 am	and tagged with adoption, Adoption Process, Forgiveness, Match Day, New Parent, Preparation time, single mom, Single parent, Support and posted in The Adoption Process. You can follow any responses to this entry through the RSS 2.0 feed. So..you have a child who can talk to you and tell you what kind of room she likes, fav colors, etc. She goes to school so no mommy guilt about working. And she probably sleeps through the night 🙂 She’ll tell you what she likes to eat and wants to do. She can pick out her own clothes. She will go on shopping trips and out to eat with you at grown up restaurants (you get to skip greasy pizza at chuckie cheese). When you’ve had a bad day at work, she will listen and comfort you, and likely offer you great advice, like my teen does. She can also do laundry, push a vacuum and take the dog on a walk and pick up its doo doo. Hmmm – I think this is just perfect! Although I’ve loved every age with my girl, from about 12 on has been very special because we’re also best friends and confidants. Although I’m not a single mom, as a military spouse it sure feels like it sometimes! So you two will be close and have each others back. And you’ll be a great mom. Don’t listen to he naysayers, I am sorry people (so called friends?) feel like they need to give you their opinion instead of their support. Can’t wait until you Skype with Hope! How exciting!